One of the things that I miss about New Zealand is fish and chips, or fush un chups in our delightful accent. I do presently live in a tourist town by the sea and can eat very fresh and delicious fish and chips if I take a short walk out to the cliff, but to my mind, that is not real, pukka fish and chips – not that of my memories, at least. I went down with Ed and maybe my mum or my dad, I can’t quite remember. Mrs Ransley greeted us as we entered. She taught at the school I had went to but owned our local fish and chip shop and worked it – overalls, apron and all – in the evenings. After we placed the order, I watched my brother play spacies (coin-operated video games) until it was ready. I paid, full of pride, and we took it home. 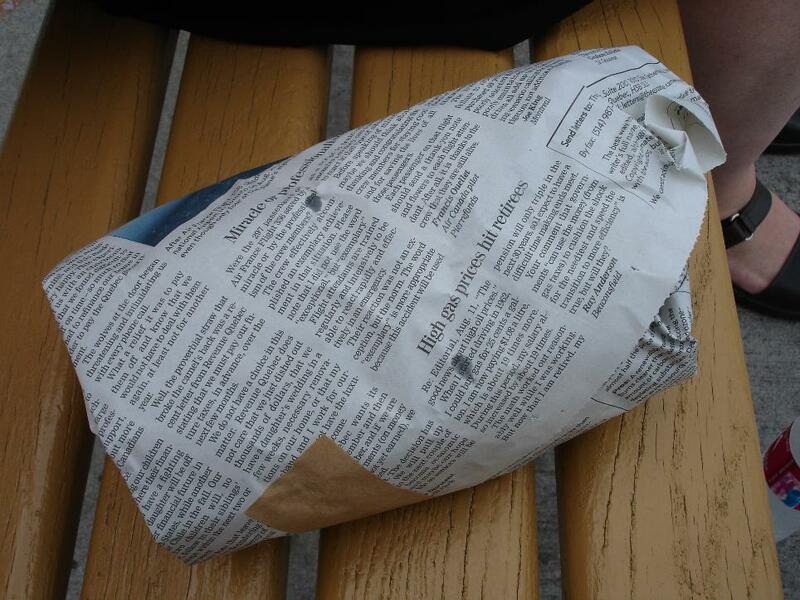 Unwrapping the newspaper, we met with an unfamiliar sight. 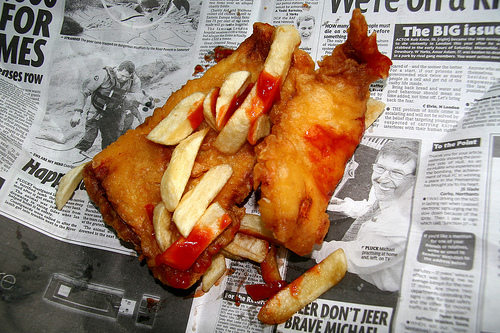 Fish and chips are usually jumbled together – a bed of chips with pieces of fish, hot dogs, donuts etc arranged around/on top of it – but Mrs Ransley knew us all personally and had added a personal touch: she’d organized the whole meal into five little parcels, one for each of us, all labelled by first name. I eagerly grabbed mine and took it to the living room to watch TV, ripping a corner off the parcel through which to extract steaming pieces of potato, soggy and delicious. Much to my embarrassment, I didn’t actually enjoy fish in really any form until I left NZ just three and a half years ago – first Japan opened my mind to sushi, then Kerala to meen curry and meen fry – so my little parcel probably contained a hot dog and chips. Never mind. As I say, these were not great chips. They were not crispy, golden, perfect jacket wedges like you would get at some expensive boutique fish and chip shop nowadays. They came from a frozen packet, as did the fish fillets, and were deep fried to hell and back. They constituted the kind of grease-heavy meal that, upon finishing, you would think, “I’m never eating that again”. But it was so exciting – that Friday night reward at the end of a week of school, or a special treat whenever we went to the beach. The fish, if I had it, was generally pretty tasteless and improved vastly by a vat of tomato sauce. It’s not the taste of the food that I remember, though – it’s the feeling of unwrapping that parcel in the living room or by the sand, tapping into the thrill of opening a gift at the same time as being allowed to eat food that is bad for you. Maybe that’s what I miss – that nostalgia-tinted memory of a simple childhood joy – and not the fish and chips themselves. That feeling never quite dies away completely, though. As those boutique shops replace the Mrs Ransleys of this world, it’s harder to recapture, but if I get to return to NZ this summer, I’m hopeful that I’ll be able to find it. You can’t get good ol’ fish and chips in Mumbai? I’ll bet if you described them to some street entrepeneur, they’d have an imitation ready for you the next day – probably with chilli and masala spices everywhere, but fish and chips nevertheless. Weird, I have no recollection of this instance, nor “Mrs Ransley’s Fish ‘n’ Chip Emporium”! I think I have too many romantic fish & chip memories and they all blur together. I guess I’m lucky. Yeah, I’m sure it was nothing special for anyone else, but it was imprinted in my little mind… actually, maybe you were off recording or photoshooting with DBS? Your shout when you return to NZ then?? This blog is interesting to me as it articulates something that I’m dealing with a bit at the moment. The feelings that surround fish & chip night for NZers is a hard one to address when helping parents make healthier choices for their families (as I am). They are often reluctant to let go of it. Once a week seems entirely reasonable to most and there is a widespread belief that good ol’ FnCs is the cheapest dinner available. The feeling of treating yourself on a Friday night after a hard week of work, or the warmth generated by those childhood memories makes fish and chips so appealing to some. It takes some creativity and insight to find replacements that are actually acceptable. The Friday fish and chip night has a firm hold on many NZers. It would be my pleasure to lay on a spread of fish and chips – you’re on. I completely agree with what you say about it being an unhealthy habitual choice for a lot of NZers, though. 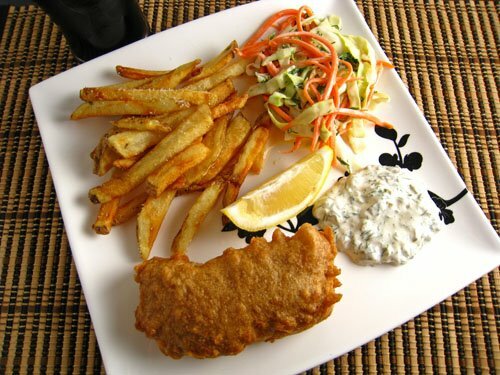 When I was actually in NZ, I very rarely ate fish and chips – like once or twice a year – because I always felt hideous and bloated afterwards… it’s only since I left that I get cravings sometimes. As I say, it’s not the taste that I want, but that feeling of being a Kiwi kid again. Do you see a trend of families moving to healthier choices, then, or are fish and chips as deeply rooted as ever? Great post! Childhood food is so nostalgic, especially when it was a real special treat. I really, really want fish + chips now!! !